Have a MacBook Pro with USB-C ports? Then you know how connecting a USB flash drive, reading an SD card, or hooking up to a big-screen display can be an expensive exercise in futility. You usually need to buy a collection of dongles to connect up to various systems, which can add up and still not give you the connections you need! 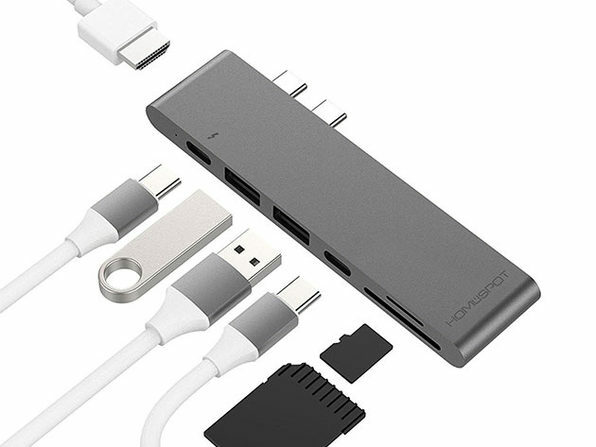 These two HomeSpot USB-C Hubs for MacBook Pro take two of your USB-C ports and add a variety of additional ports to the MacBook Pro, all for just $54.99 ($69.99 with HDMI). The USB-C for MacBook Pro model ($54.99) adds dual USB-C ports, with a dedicated port for Thunderbolt 3 (40Gbps) and power delivery, 5K video out, 2 USB-C ports, 2 USB-A 3.0 ports, an SD port and a microSD port. It works with both the 2016 and 2017 MacBook Pro 13-inch and 15-inch models. If you need a dedicated HDMI port, then for just $15 more ($69.99) you get everything included with the less expensive model plus a 4K HDMI out port. These USB-C hubs are extremely popular with Apple World Today readers, and this deal doesn't last forever. Get yours today! Like this deal? Consider supporting Apple World Today with a $5 monthly Team AWT membership.